from December 25th 2010 to january 14th 2011. Taking into consideration the request of a few during his vist to Europe this summer, Tulku Ugen has decided to bring the dates of the butterlamp retreat back to their original period for this year. So Tulku Ugen confirms with you once again that the butterlamp retreat will be held at Khordong Byangter Gompa from December 25th 2010 to january 14th 2011. It is recommended for those of you who plan to take part in the retreat to confirm their arrival as soon as possible in order to book the rooms for them. In order to celebrate the 20th butterlamp retreat several things are being prepared which shall be communicated once confirmed. The most important and the greatest wish is to see as many students of Rinpoche together here as possible to make this event a warm and powerful commemoration, a celebration of these 2 millions lamps offered for world peace and the benefit of all sentient beings in these times. Meanwhile, the year comes to an end and with it our savings for the daily activities of the gompa. Please, any donation to support the activities for the year 2011 are most welcome and needed. It all started in the 1950’s when Chhimed Rigdzin Rinpoche was doing a 3 years 6 months retreat at the sacred place of Tso Pema in India as advised by his root guru Tulku Tsorlo ( Tsulthrim Zangpo).His needs were then generously taken care of by the king of Zahor, Jogin Singh himself, who made sure Rinpoche had enough butter for his offerings and enough food for himself. During this time Rinpoche wrote an aspiration prayer of lamp offerings which came to him as a mind Terma for the benefit of all sentient beings in general and in particular for the supreme incarnation Tsulthrim Zangpo also known as Terchen Yeshe Rolpa Tsal, his root guru Tulku Tsorlo, in order to clear the obstacles related to his entering in his 61st year and to help him live for many more years. Later on Rinpoche modified this prayer so that it can be practiced and integrated within every puja. Much later, Rinpoche received instructions in pure vision from Nuden Dorje to offer 111.111 lamps every year for the sake of world peace. 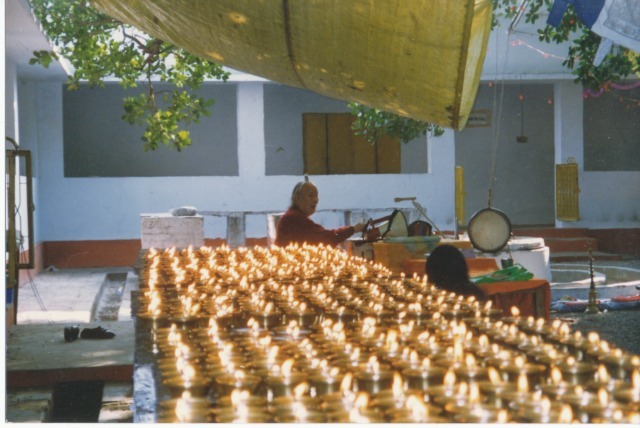 The first butterlamp rereat took place in Bodhgaya with the help of a handful of Chhimed Rigdzin Rinpoche’s western disciples together with his family members in December 1991. Since then the 3 weeks long butterlamp retreat has taken place every winter, first in the premises of the Mahabodhi Society in Sarnath and at Khordong Byangter Gompa since the land was purchased in 1996. Over the years this retreat of lamp offerings has become a tradition, seeing more and more participants coming from all over Europe to spend time and practice together with Rinpoche. The retreat consists of the intense practice of the Vidhyadara guru Padmasambhava according to the ritual texts discovered in the 19th century by Khordong Terchen Tulku Nuden Dorje Drollo Tsal, together with the recitation of the aspiration prayer of the lamps. 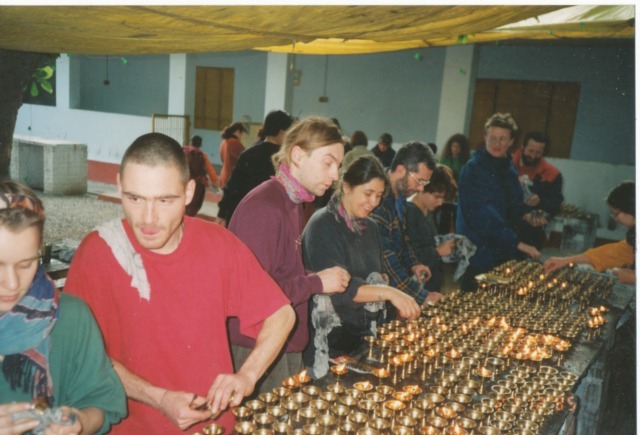 In between the practices, participants engage in the preparation and the lighting of the lamps. This way an average of 6500 lamps are offered everyday. Since Rinpoche passed away in June 2002, the tradition of this intense and powerful retreat has been kept alive under the leading guidance of his son and Dungse Tulku Ugen Chencho. In Indian language: "The lamp story of the Gold-Handed king. "In Tibetan language: "The lamp story of the Gold-Handed king and the Sutra of prayer." Salutation to the three Ratnas.
" Venerable one, what kind of virtue did you create in former times? You possess the minor and major signs and light rays are coming out of your body. Please, tell me the reason." "O great king, please listen! When I was an ordinary being, I saluted all the Buddhas of the ten directions and developed the quality of bodhimind ( Bodhicitta ). Then I put one thousand cotton wicks, which were dipped in oil, on my body, lit them and offered my body as a blazing lamp to all the Buddhas of the ten directions without any regret. Thus I became Buddha Dipamkara." he said. "Listen to me all the Buddhas of the ten directions and my teacher Bhagwan Dipamkara." "May the size of this lamp turn into the size of a pot able to contain countless worlds and may the wick become as big as Mount Meru, may the rays of its light reach from the top of the world to the Abhichi Hell. May the rays of its light reach outside the iron mountain, where people are living in the dark, covered with sins of their own previous bad karma.It is so dark that people don't even see their own movement. By the power of this light may everything be seen here clearly and may the duration of this light remain throughout the existence of the Buddhas of the three times ( past, present, future). May the number of the lamps become so many that it be enough for all the numberless Buddhas, who live in the endless worlds of the ten directions. May this light reach to the Arupa place and shine clearly. When the Devas of this place see this light, their minds will be immediately awakened and their bodies will possess the minor and major signs. They will obtain the ability to meditate higher and become free from the four Ayatanas. They will obtain the chance to practice Tathagata Samadhi (meditation). May this light also shine clearly in the place of Rupaloka and may the Rupaloka Devas obtain supreme bliss by doing this Samadhi and get an opportunity of Anagami (one who does not come back to the world again). May this light also shine clearly to the place of Kamaloka and the mind of the Devas of the Kamaloka, remain detached from the good things and may they look into their own mind and achieve the opportunity to practice the four Samadhis one after the other. May this light also shine clearly to the place of Asuraloka and may they be freed from their ego, anger, rough-mindedness and instead achieve love, compassion, happiness, equanimity and practice the Samadhi of peace of mind. May also the light shine clearly to the people of the four Islands and they be freed from suffering and be industrious to practice Dharma. May the light shine clearly to the animal realm and they stop killing, eating and fighting with each other. May human beings stop killing and torturing the animals and the animals be freed from their stupidity and possess the three higher knowledge (qualities): hearing, thinking and doing meditation. May the light shine clearly to the Hell (Yamaloka) and the sentient beings there abstain from killing, cutting, and beating. May its inhabitants obtain the opportunity to hear the Tathagatta's teaching and generate compassion in their mind. 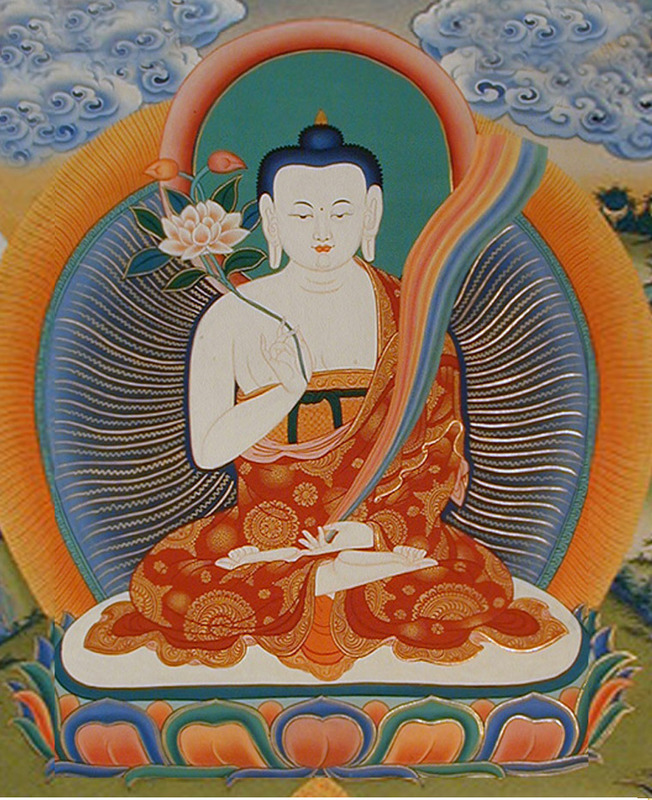 May the light shine clearly to the place of Hungry Ghosts and may they be freed from thirst and hunger by the blessings of Akashagarbha Bodhisattva and may they have sufficient food and drink for ever and gain the knowledge of Danaparamita (giving without greediness) and wish to practice it. May the light shine clearly to the Hot and Cold Hell, because of their previous bad karma they have difficulties suffering from being too cold or too hot etc…By the blessing of Bodhisattva Aryalokiteshvara they must be freed from the unbearable sufferings and practice Shantiparamita (practice of patience of forgiveness). May this light shine clearly outside the Jambudvipa, where it is so dark that people don't even see their own movement, because of their previous bad karma they are very hungry and thirsty and crave for food and drink. In the hope of getting something they raise their hands to the sky but it is unfortunately so dark that they sometime injure themselves with their iron claws and eat their own flesh (because the suffering from hunger is greater than torturing their own bodies). Thus by the blessings of Tathagatta Amitabha may they be freed from this darkness and obtain a rebirth in the Sukavatikshetra (paradise of Amitabha). May this light shine clearly to the place of Nagas that they may be freed from ignorance and greediness. May they get the opportunity to practice Danaparamita (giving without greediness) and be freed from the creatures that fly from heat, fire and hot sand etc…like eight difficulties. 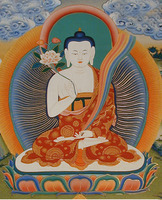 And may they take refuge in Buddha, Dharma, Sangha and achieve peace in the mind and acquire all the things they wish. May the light shine clearly to the place of Pythins (demi-God or huge God of the soil, of the serpent kind) and be freed from suffering and attain immense happiness. May this light also shine clearly outside the Jambudvipa namely Bhumipati (land god), Devas (god), Nagas (beings living in the water), Pitalis, queen of the Pitalis, great ocean, sea, lakes, wells, big rivers, small rivers, springs, Luma (small red lake). And also to the big mountains, rocky mountains, bad roads, meadows, fields, big forests, forests of one big tree only, Monasteries, Stupas, cities, villages, etc. By the power of this light may the beings be freed from their illusions and have faith in the three jewels, grow bodhicitta and attain Moksha (Buddhahood). Thus ends the prayer of the Gold-Handed king. May we endless beings obtain birth to Tathagatta Dipamkara's place and attain Buddhahood. And we must preach to all. This prayer is from the Lord Buddha. The first portion is the original from the Sutra and the second portion has been modified for the sake of clarity by C.R. Lama. To do the puja one turns his hands towards the sky and recites the prayer of the Gold-Handed king. Today we dedicate the merits of this practice to the deceased and we offer lamps continually. We all pray that any virtues arising from this be offering to Padma Sambhava and Buddhas and Bodhisattvas. This text was re-typed in English only, with some amendments in translation done by Tulku Ugen Chencho together with Alexis Lefort on March 18th, 2008 from Khordong Byanger Gompa according to the text published on July 1st, 1987.